Mike Orlando have teamed up with Rocktron to generate a new unique wah pedal, Rocktron Mike Orlando Signature Wah, which was developed in three sound settings where the settings his vintage wah effects to be part of the most frequently used by the supergroup Adrenaline Mob’s guitarist. Normally this wah pedal settings, giving a frequency sweep of a more modern, while the bass is not only an ideal setting for seven-string guitar (and bass guitar), but also gives a new dimension to standard wah effect on the six-string guitar in general. Mike Orlando signature wah contains easy battery access compartment. But in addition to using the battery, this pedal can also be activated by using the Rocktron DC OnTap Universal Power Supply. And like a wah pedal Rocktron other, Mike Orlando signature wah is also ready for use on stage, where a screw had been available to customize the characters ‘touch’ that you want. Is it lighter or heavier? Read also “Schecter Tommy Victor Signature Electric Guitar Reviews” and another gear reviews. 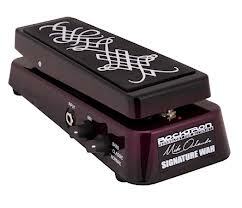 Hopefully the article of Review: Rocktron Mike Orlando Signature Wah useful for you.